Many Christmas traditions in Bolivia have been disappearing over the years, but some of them still remain almost exactly like they were in the Colonial period, mostly in rural areas and small cities. In the Central valleys and in the East, the weather makes it possible for people to go out on Christmas Eve and visit the great Nativity scenes that include a manger made with rustic materials, which are traditionally set up in squares and churches, and are still set up in many homes with the participation of the whole family, with contests and prizes to the best Nativities as in Santa Cruz de la Sierra. Due to the cold climate, in the Andean region it’s more common to celebrate at home with hot chocolate and buñuelos (fried biscuits), singing and dancing, and they also follow the tradition of setting up mangers and Christmas trees. In the past, there used to be a traditional public dramatization of the annunciation and birth of Jesus on December 24, for which adult males were chosen to play the roles of the angel Gabriel, Joseph, the three wise men and the shepherds, a girl to play the role of Mary and a small baby for the Savior. The girl was mounted on a donkey, and Joseph grabbed the reins to lead it into a manger normally installed in the village’s church, or otherwise in the central square, where Jesus would be "born" later, and then the actors would dramatize the story of the visit of the shepherds and wise men. It was also customary for children, in groups or alone, to go from house to house singing carols and dancing before the Nativity scene in each house, after which the host would invite them to punch, or a soft drink and chocolate if they were very small, and buñuelos. In the highlands, the Aymara peoples adorned their cattle and threw flower petals at each other on Christmas, which for them was the feast of the awatiris, the young male and female sheepherders who looked after the sheep, llamas, vicuñas, etc., the community owned. December is a month of changes for this ethnicity, because it was in this month that new shepherds were assigned to communal labor for the next year, indigenous authorities were elected and marriages celebrated. A peculiarity of this Andean culture that is not repeated in the rest of the country is to fabricate traditional clay figurines for their Nativity scenes; while the manger is technically a Christian custom, for them it is actually an expression of a superstitious desire to have more cattle the following year, a desire quite comprehensible in a society that relies heavily on sheep and llamas to support themselves. These clay figurines must be created in pairs: two, four or six animals of each species, and the next day they must be buried in the yard, but before they have to ch'allar (pour libations on the Pachamama, the Mother Earth) with alcohol and coca. It was also during Christmas night when the sheepherders watching their cattle in the open air had to adorn their hats and their livestock with flower wreaths, pierced their ears so they could wear earrings and hanged colorful wreaths around their necks; then passed their obligations (all work was communal) to the new shepherds, and threw flower petals up in the air whilst they played pinkillos (flutes made of thick reed) and danced. Often they proceeded to brand the new cattle that had been born since the previous festival. In the old days of the Spanish Colony, it was a tradition to have chocolate and buñuelos for breakfast during Christmas, especially in areas with strong Spanish influence; or hot coffee and dishes similar to meat broth, and in indigenous communities they had a traditional biscuit called jakhoilisa, prepared with dough made with quinoa, which was to be eaten on December 25 in all the Aymara communities. Nowhere in the country was the panetón (Panettone pudding) known as a traditional Christmas recipe, much less the roast pork, eggnog, baked turkey and many other foods that are now automatically associated with Christmas. The passage of time has eliminated the many differences between the traditional ways of celebrating Christmas in all Bolivian regions. But three traditions are still maintained throughout the country: the setting up of the manger, attending Midnight Mass, and the Christmas dinner, where they serve picana, which is a slightly spicy and somewhat sweet broth that has corn, beef, mixed vegetables and wine. Failing that, pork or turkey is served, and usually the dinner ends with a toast at midnight. The following day, people have buñuelos for breakfast, a Christmas pudding or homemade pastries typical of each region. The Nativity scenes are usually set up in the last days of November, and there’s a preference for elements made by hand and for figurines uniquely fabricated to be different from those in other mangers. On the manger, they place a baby Jesus made of porcelain or plaster, which usually is a family heritage due to the belief that it is bad luck to buy one, because a purchased one doesn’t bring luck and blessings to the house, and for the same reason two babies Jesus shouldn’t be put in the same manger. It’s considered better to inherit one or wait for someone to give you one as a gift; his clothes must be changed every year, and he also must be taken to mass each year to be blessed. In our days, it’s common to decorate balconies, doors and windows with Christmas lights, and not only the manger as before, and candles no longer illuminate it as it used to be. 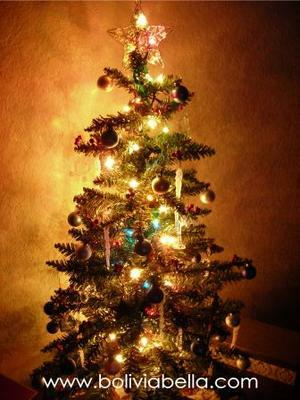 Now it is more frequent to use artificial small trees, artificial materials and plastic animals instead of the handmade elements, real tree branches, moss, earthenware and clay figurines of the past. The last tradition that hasn’t been lost yet, because the majority of the population is Catholic, is the mass on Christmas Eve (one day before Christmas) known as Midnight Mass, that is celebrated from ten o’clock until long past the twelfth hour, and to which people bring the infant Jesus from home to be blessed. After Mass, sometimes the infant Jesus is taken in procession from the church to the Nativity scenes outside, and then people sing carols before the mangers to accompany the divine child until dawn. After praying or singing carols past midnight, gift opening ensues.